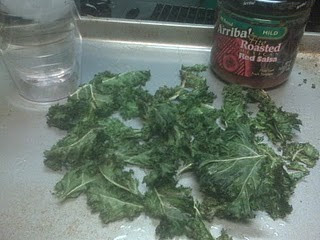 As I mentioned in the previous blog, Karen and I attempted to cure our chips and salsa craving by baking kale. And as I said earlier, it tasted nothing like good ‘ol chips and salsa from Maudies, but it was worth a try. For all my team 4 Paleo friends I am posting the super, duper easy recipe for you. Rinse kale and pat dry…make sure it’s really dry. Tear kale into “chip size” pieces and put in a bowl with lid. Drizzle olive oil (or pour), sprinkle sea salt and pepper, put the lid on and shake shake shake! Place kale “chips” on a baking sheet and bake for 15 minutes or so…they should be crispy enough to dip, or attempt to dip in salsa. Karen and I ate the whole bunch of Kale, well her mom helped us a little, too. But, that’s how good it was. Maybe because our taste buds no longer work…who knows. Give it a try and let me know what you think!